We were recently interviewed by Outsized, who wanted to find out more about our experiences and opinions on Blockchain, particularly in financial services. Up till now, the majority of time spent discussing Blockchain has been focused, face-to-face workshops, training sessions, and other meetings. This interview provided an interesting diversion from the norm of tailored discussions, into a much broader, and more general approach. At Outsized, we work with financial services and PE clients to help ensure that their projects reach full potential. We help them scope out and structure projects, then match them with high-quality consultancies, agencies and experts. In our series ‘5 Outsized questions about…’ we are sharing insights from our network around strategic issues that others might benefit from. We wanted to know more about the Blockchain in financial services. To find out more, we spoke to Maarten Boddeus, principal consultant at Yellowtail Software. Maarten brings a broad range of experience on the edge of business and IT. He is seasoned in the implementation of financial planning solutions and works at the coal face of robo-advice. With Blockchain as the newest kid on the block, Maarten and his colleagues are now actively working on bringing Blockchain to real life solutions. There is a lot of hype around the Blockchain. Is the hype justified in your opinion, and should everyone be giving it attention? If so, how are you recommending to financial services companies that they approach Blockchain, as a relatively young technology? Without a doubt, the Blockchain has the potential to be one of the most remarkable innovations of our generation. The hype that has built on this realisation is not terribly surprising, but it is still early days. However, there are also many real-world and tangible applications already in play, or in development, so the value potential is undeniable. Every business and technical decision maker should keep a close eye on developments in this space and pay attention to practical solutions for real problems in their own and neighbouring industries. This is easier said than done. Therefore, an important part of our Blockchain proposition is a consulting approach to educate, explore and collaborate with businesses in defining Blockchain applications through a series of workshops and “labs”. In short, financial services companies need to explore and try Blockchain. Don’t ignore it as a hype. If more parties work together (internally or externally), there is a possible gain to be made. The correct application of Blockchain technology will optimise the process, increase trust and will make life easier for technology users. The hard work and thinking starts with understanding and finding, yet we are glad to assist and facilitate this process on concept and technology. You’ve recently announced the launch of FuzoDNA. Please tell us more about that? The need for FuzoDNA came out of workshops and sessions we have done with various clients. A common theme was the desire to learn more about Blockchain and explore its possibilities, coupled with an understandable caution in committing resources to a relatively new concept that might turn out to be a “fad”. We decided to build a product that easily enables businesses to start leveraging the Blockchain in real ways, without needing to become experts in the underlying philosophies, concepts and individual tools. We simplify and speed up the introduction of this technology, provide additional tools to exploit the potential whilst remaining Blockchain-agnostic, so that businesses are not tied to a particular Blockchain platform going forward. Coming out of the consulting and workshops you do, what are some of the interesting use cases that you’ve seen in financial services? Initially Blockchain was all about financial transactions, but it is clear that innovation has transcended this limited view into a much broader landscape of use cases. The use cases for payment-like-services probably remain the most well-known (payments can now be executed without third party intermediaries, clearinghouses, and so on). However, there are many more interesting subjects including self-sovereign identity, title-deeds, tradeable equities, bonds, legal contract management and notarisation. Once you take it a step further by adding so called ‘smart contracts’, there is a whole series of undiscovered use cases in more industries, such as the mortgage market. Do you see the Blockchain having a particular effect in emerging markets with low penetration of financial services (for various reasons)? Application of Blockchain technology is an opportunity to leapfrog for emerging markets as they ‘suffer’ less from legacy constraints that might play in more mature markets. Every new business concept can be developed from scratch on a Blockchain; there will be no technical or existing economic and/or political hurdles to take. There are several exciting projects across various sectors currently underway in Africa, including land registry, real-estate management in Kenya and Ghana, the recent successful proof-of-concept project for wholesale interbank settlements by South Africa’s central bank and voting systems in Sierra Leone. Generally, governments in many emerging markets are actively and vigorously promoting innovation in this space. Many commentators note how the Blockchain has the potential to remove many intermediaries, and thus costs, but do you see it affecting user experience in other ways as well? An interesting one is where handover of goods can be coupled with payment execution. This comes close to the user when they are (online) shopping, or trading with peers as it reduces insecurity of being paid late or not at all. Therefore, we also see quite some future for Blockchain in retail settings. Furthermore, there is a current shift of balance underway which enables more control for the individual, particularly in the realm of their personal data. This is most evident in recent high profile events (Facebook etc scandals, GDPR and similar legislation, and so on). Blockchain is uniquely situated to play a direct and visible role in the end user’s life, particularly in this regard. Finally, there is also a growing movement around consumer ethics in which Blockchain applications provide awareness of true and trustworthy provenance, efficiency, social and ecological impact. There are already platforms in development that seek to harness this and essentially reward it. Outsized offers banks, insurers, fintechs, financial inclusion and investor clients access to a pool of vetted, high-quality consultancies, agencies and freelancers. Our senior staff possess extensive sector and consulting backgrounds, enabling them to help scope out and structure your projects. Our internal expertise coupled with high-quality consulting partners maximises ROI on your consulting spend. We match your project requirements with proven skills, not the brand of the providers. 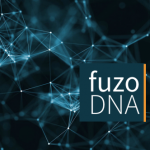 To read more about the FuzoDNA platform, read the whitepaper here. To find out more about how Yellowtail can help you begin to unlock the potential of Blockchain in your business, Contact Us.